The Bobcat Chronicle: Leasure is off to Nationals! Leasure is off to Nationals! Monday March 19th, at about 12:30pm, Senior Captain Kara Leasure will be on her way to Indiana - to one of the world's true meccas of fast swimming; The IUPUI Natatorium. More impressive to me though is the list of US Olympic swimmers that made the team by racing in that pool. The 1988, '92, '96, and 2000 US Olympic Trials were hosted at the pool we are heading to! Names like Janet Evans, Matt Biondi, Tom Jager, Gary Hall Jr., Summer Sanders, Pablo Morales, Tom Dolan, and Dara Torres are inscribed onto the wall for all to see (among so many other greats). Those are the people I got to watch on TV once every 4 years growing up. Nearly every race I watched was at the pool we are heading to. They were true heros, icons, and idols to me. 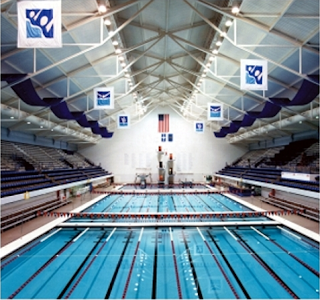 It is only fitting that this is place where Kara will wrap up her Bates Swimming career. She has done so much for Bates Swimming over her four years. From leading in the pool during both practices and meets, to being elected captain her senior year and leading with her advice and voice of reason. From breaking multiple individual records, to helping relays rewrite the record books. And, just recently she was elected to the NESCAC All-Sportsmanship team - by her peers - showing you another side that many don't realize an accomplished swimmer can have. In fact, on the final day of women's nescacs I caught her cheering for a Williams swimmer during a national level time-trial of the 200 breast. It only occurred to her at the end of the race that if that girl went faster than Kara she might not be heading to her final dream of competing at the DIII national meet. Clearly, she is all about the right things - and taking advantage of the sport, her teammates, and the opportunities that lie ahead of her. There is no doubt that by being in it for everyone, she has truly benefited herself. So, I believe it is fitting that Kara, a role model and idol for future generations of Batesies is heading to the place where so many role models and idols were made. She deserves to swim in the same water as those great swimmers before her. Yes, talent wise she may be smidgen behind those athletes carved into the wall... but I dare you to find a better person. Here's to some good times in Indy! INDIANAPOLIS — Bates College senior captain Kara Leasure was selected Thursday to represent the Bobcats at the 2012 NCAA Division III Swimming & Diving Championships, to be held March 21-24 at the Indiana Natatorium in Indianapolis. Leasure (Los Alamos, N.M.) will compete in the 200-yard breaststroke on March 24. She won the NESCAC title in the event on Feb. 19, finishing the final in 2:21.11 to break her own Bates record. She had also recorded a national consideration time of 4:35.58 in the 400 individual medley, and another in the 500 freestyle (5:04.09) — remarkably unusual versatility. Leasure will be Bates’ first representative at NCAAs since 2009, when the team sent Katelyn Drake ’10,Charlotte Green ’11 and Kelsey Lamdin ’09. Hope you have an amazing experience...soak in every second! A great way to end your college swimming career. Nothing like a little Hoosier Hospitality!! Thanks for the great words Pete. We are soooo proud of the awesome person that Kara is. Kara = Ultimate Warrior. She loves pain.